Photo source: Copyright © Fritz Frankhauser, OMF Intl. Used with permission. The Northeastern Tai, also known as the Lao Isan, are dispersed throughout seventeen provinces in northeastern Thailand. 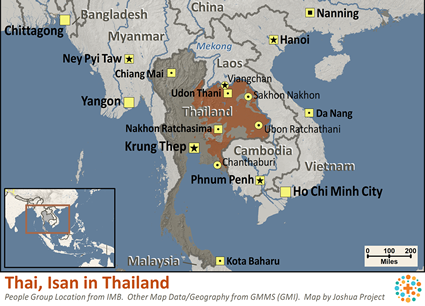 This area takes up nearly one third of Thailand's total land mass. It is basically a flat arid plain known as the Khorat plateau with infrequent rainfall and few natural resources. The region is noted for its archeological relics and monuments dating back to Khmer influence under the Angkor wat regime. Many of the present day residents of the Khorat plateau were forcibly relocated to this hostile region over a period of a hundred years from the Lan Chang Kingdom in what is now the Peoples Democratic Republic of Laos. 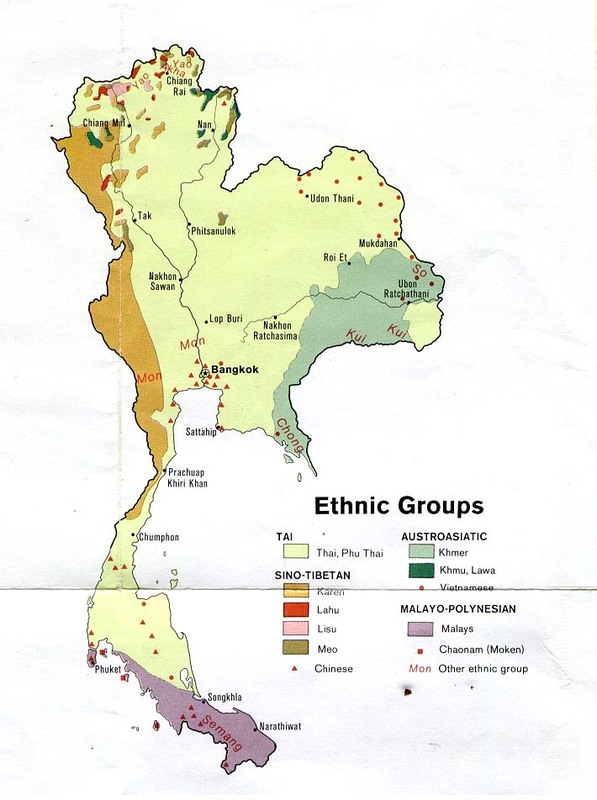 Later the people, the region and their language was labeled by Siamese kings as Isan, the Pali word for northeast. Even though this region is now fully incorporated into Thailand and all residents are Thai, the Lao Isan language, unique diet, ritual and culture continues to thrive among this people group. Most of the Northeastern Tai are farmers dependent primarily on rain-fed agriculture. Major crops are paddy rice, cassava and sugar cane. Like other Tai groups, they also raise cattle. Availability of fresh fruits, vegetables and fish varies with the seasons. Agricultural production remains low, due to the relatively dry climate and the saltiness of the soil. Although agriculture and industry is hindered by the shortage of water and internal infrastructure for transportation, the Northeastern Tai are still able to produce their world famous mud-mee silk. For the most part the Northeastern Tai are organized into small villages which are part of subdistricts, under district control. The majority of the population lives in villages near their surrounding farmland. Village and district leaders are elected locally. Districts come under the governance of the province structure. Governors are appointed by the central government. Each province has a number of representatives in the parliamentary government correspondent with its registered population. Isan has the highest population statistics for all of rural Thailand and therefore the majority of the rural voting population of the country is located in Isan. The Northeastern Tai are well known for their friendliness and openness. They are family and community oriented, which makes them generally non-competitive and easy-going. Because northeastern Thailand frequently suffers from drought, the people who live there are often thought of as poverty stricken. Yet, the Northeastern Tai have become an urban, industrial labor force, and many of them have found jobs as factory workers in the larger cities and overseas. Although the Northeastern Tai may be less developed economically than the Northern and Central Tai, public education and better communication lines in the northeastern area have brought some measure of improvement in the last generation. More than half of the Northeastern Tai are Theravada Buddhist. They follow the teachings of Buddha (the "enlightened one") and seek to eliminate suffering and improve their future by gaining merit in their present lives. Ultimately, they are in pursuit of nirvana, or perfect peace. They believe that merit can be acquired through feeding monks, donating to temples, and frequently worshiping in the temples. Traditionally, young men enter a Buddhist monastery once in their life as a short-term monk to make merit for their parents or family members. Many of the Northeastern Tai continue to practice their traditional ethnic religions particularly for important rites of passage. They combine Buddhist teachings with folk religious practices, seeking help through the worship of spirits and venerated objects. Improved nutrition, improved infrastructure, improved industry, local micro-enterprise investments, educational opportunites beyond the primarily grades, appropriate technology and fair representation in the central government, biblical communication of the good news of Christ in non-western forms that speak to popular Buddhist values. * Pray that Northeastern Tai believers will live out their decision to follow Christ in wholistic ways that speak to the Thai Isan worldview. * Pray for those who will contribute to the production of culturally appropriate materials, art, music, and church forms that provide opportunites to which the the Isan may respond. * Pray that God will call forth teams of long term missionaries and intercessors who will commit to partner with Isan Christian leaders in strategic ministry. Isan is the region with the fewest missionaries per capita in all of Thailand. * Ask the Lord to raise up serving, missional local village churches among the Northeastern Tai.View Thai, Isan in all countries. Location in Country: Widespread in northeast Thailand; Kalerng subdialect: Sakon Nakhon and Nakhon Phanom.